The battery-powered, ride-on cars look a lot like the ones displayed in the toy section of your local superstore. But these cars are much more than toys. 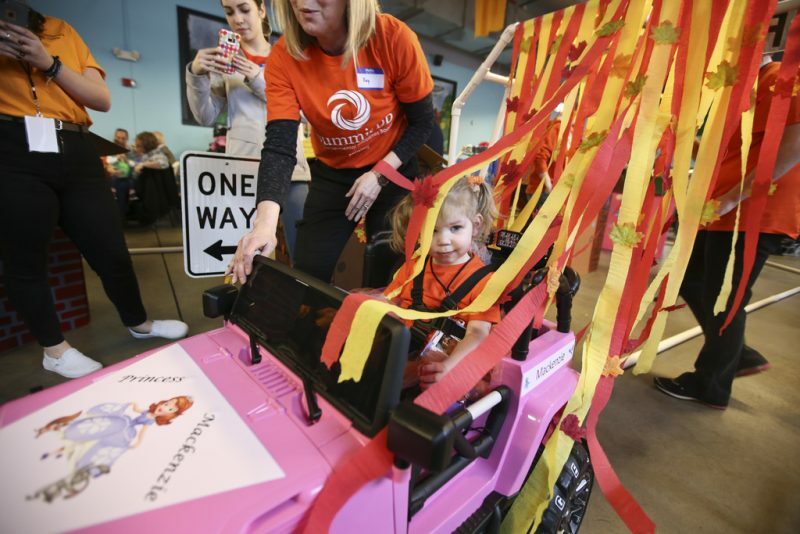 For children with disabilities, power wheel cars open a new window to the world. 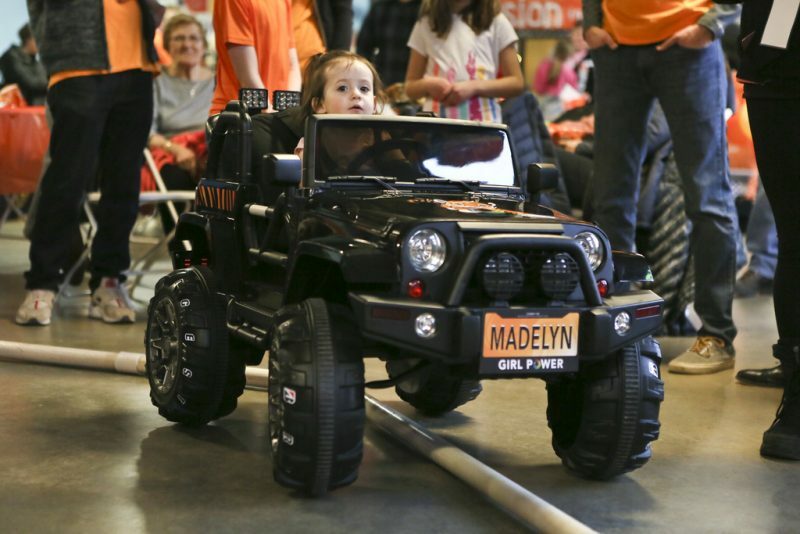 For the last several years, an Akron non-profit called Inclusioneers has brought together local engineers and engineering students to modify power wheel cars to fit the special needs of children. The endeavor is steadily attracting community supporters and participants, based on the knowledge that children benefit cognitively, socially and emotionally when they are able to participate in and explore their environment independently. 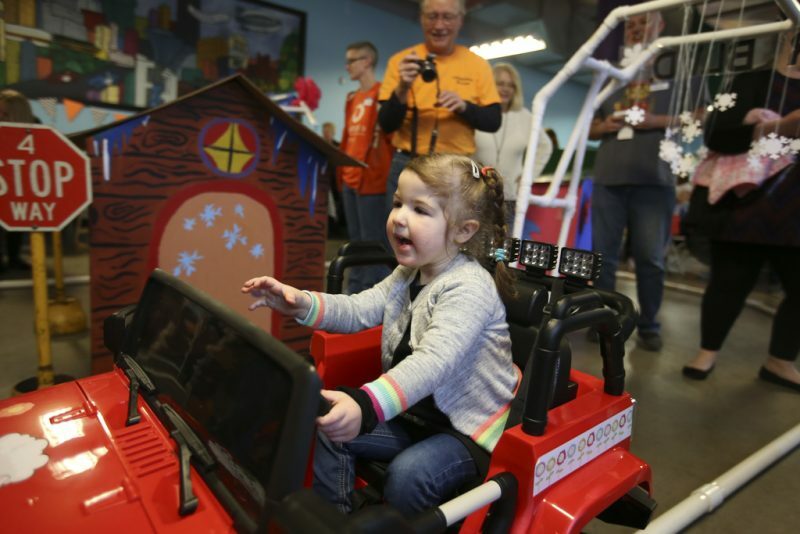 On Friday evening, 7 children receiving services from Akron Children’s Hospital and the Summit County Developmental Disabilities Board were presented custom-modified cars at the second annual “Adapt-A-Car Workshop” at the Lock 3 Commons Room in Akron. In addition to the 7 cars, the engineers modified an all-terrain ride called Wild Thing for the Boy Scouts of America, Great Trail Council. The University of Akron students from biomedical engineering and the NASA Robotics Team re-engineered the car, replacing the controls with a single joystick and retrofitting a new seat with a higher back and more support. The scouts will use their car to help children with special needs traverse the hills and trails of Camp Butler in Peninsula. The scouts were thrilled to be included, said Caroline Altizer, special needs scouting advisor. She learned about Adapt-A-Car on Facebook after the first event last year. 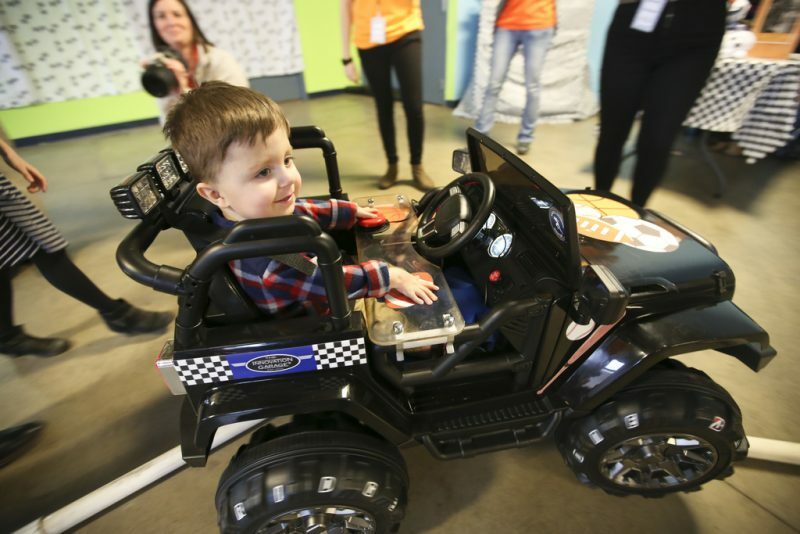 Next to Akron Children’s Museum at Lock 3, families and friends on Friday cheered as children with wide smiles gripped joysticks and tried out their new cars on a track, with assistance from pit crews. 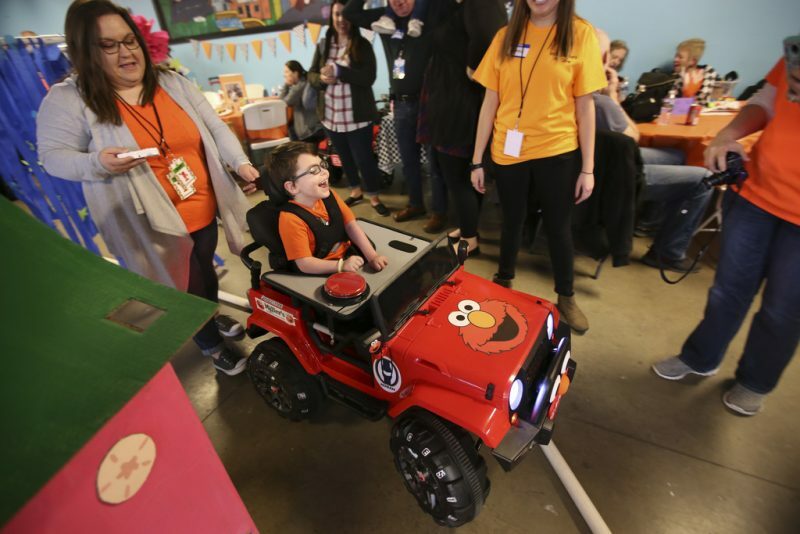 Oscar Greathouse, 2, gushed with excitement in his new black Jeep, as his mother, Samantha, and Kathryn Finley, his physical therapist at Akron Children’s, helped him along. Oscar’s car is operated by parent remote-control steering and child push-button acceleration. Oscar was born with arthrogryposis and he can’t bend his knees or elbows. He’s bright and curious, and a bundle of energy. The car will literally change Oscar’s life, said Kathryn. Inclusioneers founder Mike Firtha said he was inspired in 2015 after his daughter Haylee DeSonne, an inclusion specialist at Summit DD, called him one day with a special request. 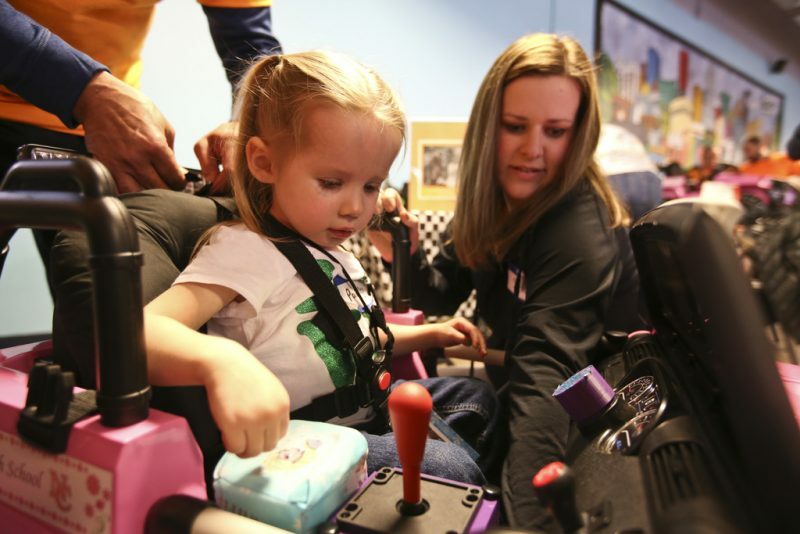 Through collaboration between the Summit board, a local business engineer and The University of Akron student engineers, they built an adaptation between the 3-year-old girl’s arm and the bicycle handlebars. Inclusioneers’ Adapt-A-Car program is based on research by Professor Cole Galloway of the University of Delaware on the therapeutic value of modified ride-on cars. Galloway founded Go Baby Go, a national program that provides mobility to children with disabilities. Inclusioneers has since widened its talent pool to include dozens of students from the university, Hoban and Hoover high schools, and mentor engineers from the business community. Air Enterprises in Akron, where Mike is director of project management, donated working space for the Adapt-A-Car project and mentor engineers, as well. Kip is short for "Rock Star"